"very easy and fast to go around"
✅ Trip Verified | Mandalay airport is not very big, so is very easy and fast to go around. The ground staff are very friendly, like all the burmese people. The airport was clean, lots of light and good air-conditioning. There is a smoking area inside. There are also some souvenir shops and a few places to eat. To get the stamp at customs it took a lot of time as there werent many desks open, and many flights at the same time, so many people started to stress a little. "bright and clean with good signage"
✅ Verified Review | Modern small airport, bright and clean with good signage. On arrival it is a short walk to the terminal. Toilets better than expected but all modern and clean. All the facilities you could want not busy and not overcrowded. I think I was expecting a small outdated airport building but obviously its a tourist hub so they have made it pleasant. "clearly built a long time ago"
✅ Verified Review | This was my first time going to Myanmar. 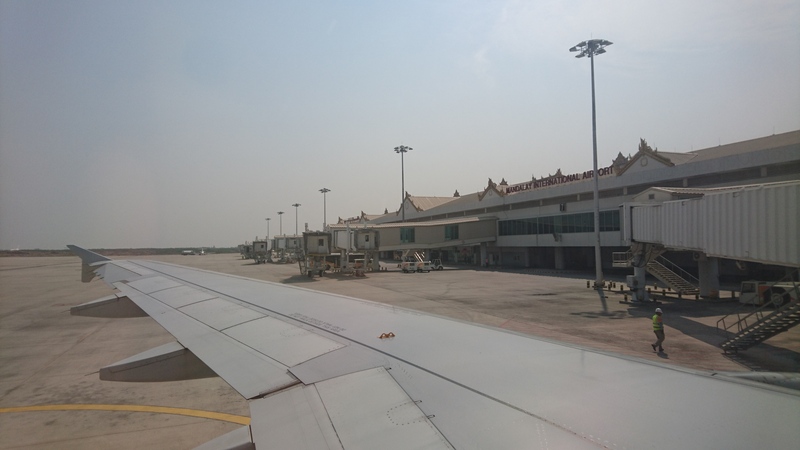 We landed in Mandalay International Airport. An airport clearly built a long time ago, awaiting the prosperous times ahead. The immigration control took a bit of time since there was an aircraft arriving from China Eastern at the same time as ours. Airport staff directed some of us westerners to the Diplomat's counter, which cut the waiting time at immigration substantially. At the airport the currency exhange rates offered for US and Euro were best at the Farmer's Bank. 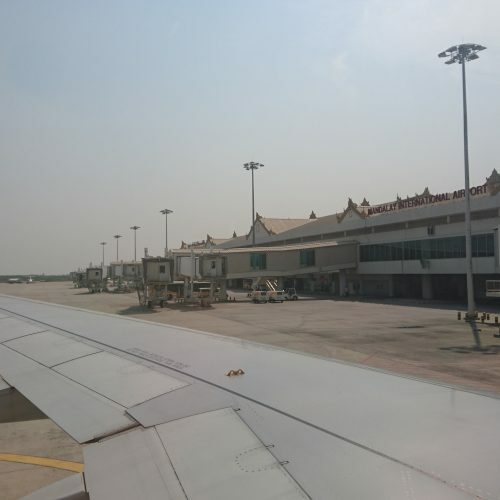 Mandalay International Airport was built at the turn of the 21st century. It serves both domestic and international destinations and is designed like many airports around the world, it just works slightly differently somehow. Arriving on a domestic flight you are bussed into the single terminal building where you walk passed unmanned Passport Control Desks to one of 3 baggage carousels before having your baggage (hand and hold) scanned and into a large Arrivals Hall with the usual selection of booths and a small café/shop selling bottled water. There are TV Screens showing which flights are coming or going. Marble floors and air conditioned. Departures start with the need to scan all you bags (hand and hold) before going to Check-in Counters which are clearly numbered in 4 banks A, B, C and D. After this is the a boarding pass check and into the Departure Hall which is upstairs (Check-in and arrivals are on the ground floor). There is a large selection of shops and a couple of bar/cafes, not all of which are open for domestic flights. Security Scanning is done at the gate and Gate 6/7 seems to be where all the domestic flights leave from via a pier down to a bus. In the Gate area there are no shops or toilet facilities just rows of seats looking out on to the apron and in the distance the runway parallel to the terminal building. The airport is larger than the current traffic levels so it does not feel crowded or too busy but it has a "new" feeling that none of the other airports in Burma (Myanmar) have. Despite more international flights the terminal still has the feel of a ghost town. After a very speedy check through security all domestic passengers are directed to a largish departure area and bussed out to their aircraft. The colour coded badges all passengers are required to wear ensure no one gets left behind or attempts to join the wrong aircraft. There are more food outlets than my last visit a few years ago sadly the washrooms and the rest of the terminal show no sign of having been properly cleaned since then. After the splendour of Yangon Airport (International - not Domestic which hasn't been updated since easily the 60s) Mandalay Airport is reminder of what could have been. Coming in to land the airport looks deserted. We were brought to the larger looking terminal by bus and instantly I recognised the Japanese design having lived in Japan for several years. Aside from the outstanding design nothing else was even close to Japan. Most of the lights were off immigration desks looked abandoned and one of the panels of glass separating the baggage and arrival halls was badly smashed. Still service is efficient if only because there is no one to serve facilities mostly work and taxis are plentiful. If the reforms continue to improve Myanmar this airport could be a real gem. If you need to fly to Mandalay - and domestic flights are not as scary as they sound - it will do just fine but let's hope for better days. It seems very under used airport - comparing the facility and the passengers go through here. It's all new (a couple years old - with very long runway). Arriving from CNX on Air Mandalay's prop plane seems odd on this runway. It's located pretty far out from Mandalay city center. The airport seems deserted after all passengers left.